In an unexpected announcement, The Hollywood Reporter says that popular Alan Moore comic series The League of Extraordinary Gentlemen will be making its way to television on Fox. In conjunction with 20th Century Fox’s TV studio, a “put pilot” has been ordered from the series meaning that it will likely air even if a series isn’t ordered. Michael Green (Green Lantern, “Heroes,” “Smallville”) will serve as the writer and executive producer on the project, and showrunner if the pilot is picked up to series. 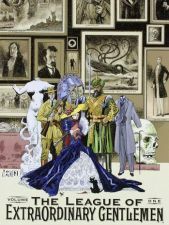 Originally created by Alan Moore and Kevin O’Neill, The League of Extraordinary Gentlemen stars a group of Victiorian literature characters including Allan Quatermain, Captain Nemo, the Invisible Man, Dr. Jekyll and Mr. Hyde, and Mina Harker of Dracula. The team is put together by the British government to foil a plot that would see the fall of the entire kingdom. The League of Extraordinary Gentlemen was previously adapted into a film in 2003 starring Sean Connery (his last film role). It featured signifcant changes from the source material and famously began creator Alan Moore’s antagonistic relationship with Hollywood.